Some memories just stick. My soon to be wife and I were sitting on a plane heading out to Turkey for a seaside holiday in what was then a relatively new tourist destination in 1987. Ahead of us stretched long hot lazy days flopped on the beach topping up our tans, eating, drinking, whiling away the time dozing and reading. It’s factual books over fiction for me, Danzinger’s Travels was a book I’d heard discussed on the radio it was first on my reading list. A graphic hair-raising account of travelling alone through Asia and on into war torn Afghanistan by Author/photographer Nick Danziger it is a powerful account filled full of daring-do approached with warmth and wit. Apart from it being a terrific read what I remember most about it was his introduction where he explained how his adventure started. Describing how he sat anxiously in a corridor belonging to the Winston Churchill Memorial Trust waiting to be interviewed for a Travelling Fellowship that ultimately funded the trip. Wow! I thought how nerve-wracking & amazing would that be. Perhaps you can imagine my excitement nearly 30 years later when ‘little old me’ was sitting in the exact same corridor awaiting to be interviewed for a WCMT Travelling Fellowship then the thrill when the letter informing me that I had been successful popped through the letterbox. My belief is that stonework still has an amazing lot to offer Society and a personally fulfilling creative outlet for those willing to dedicate themselves to it. Along the way I’ll be showing the odd pic of my own work I may even get dusty a few times. I’ve set up a specific page to record the journey – come along join us on our trip of a lifetime…read more. 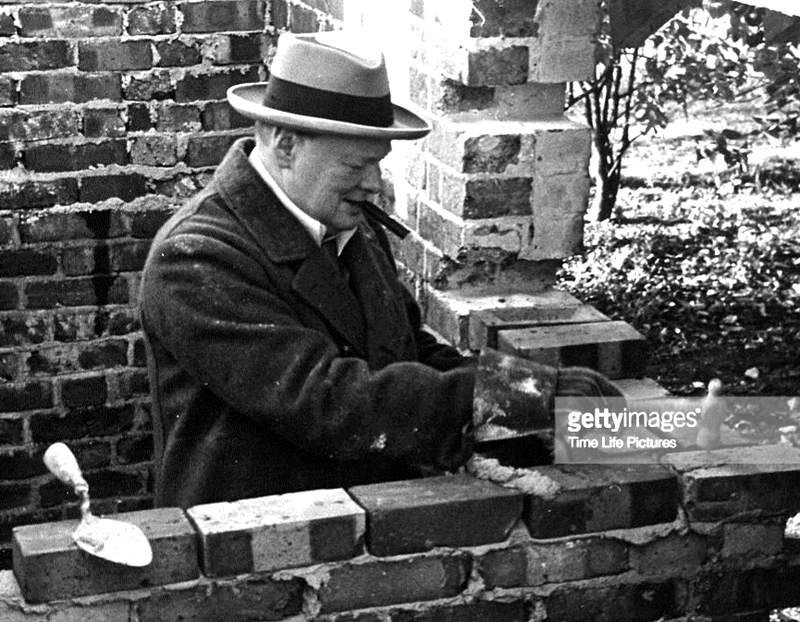 I’d like to thank the Trust for this wonderful life opportunity and of course not least thank the great man himself, Winston who as the picture shows dabbled a bit in the craft – I’m not too sure about his tools or his pointing but good effort!! !